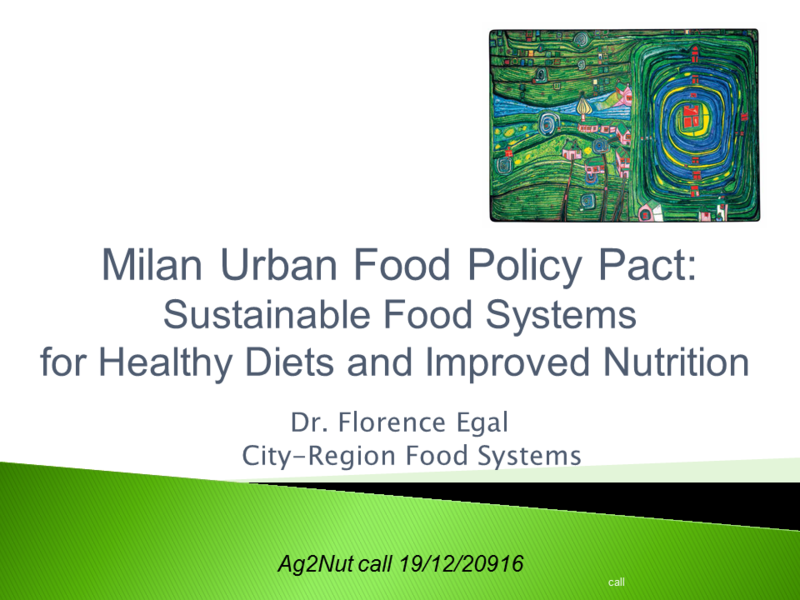 In the December 2016 Ag2Nut Community Call, participants heard from Dr. Florence Egal, who spoke on urban food system policy. As we embark on the UN Decade on Nutrition and in the wake of COP21 and Habitat III, sustainable food systems are high on the international agenda. There is now widespread awareness, in particular in the health and food and agriculture sectors, that unless we move beyond economic development and embark on a broader reflection on how to manage natural resources and ensure local livelihoods, we will not be able to address malnutrition and prevent NCDs, alleviate poverty, deal with urbanization, manage crisis, mitigate climate change or protect biodiversity. Local authorities will have a major role to play in the development of sustainable policies and programmes involving actors from different sectors and institutional backgrounds. The Milan Urban Food Policy Pact initiative has brought together so far around 130 cities worldwide. The active involvement of the health sector and close collaboration with the food and agriculture sector will be essential for effective advocacy and good planning. But it also constitutes a major opportunity to highlight the role of the health sector, and more specifically the work of the WHO’s Healthy Cities programme and Urban Health programmes and initiatives at international, national and local levels. The concept of sustainable diets offers an excellent entry point for sustainable development. We need to build upon and bring together the Health in All Policies approach, initiatives such as that of the Nordic Council of Ministers, the promotion of the Mediterranean diets, that of the right to food and social justice or linking climate change and nutrition. And the most pragmatic way to embark on joint action-learning will be at local level, building upon existing food practices and culture as well as innovative experiences.